One of the most annoying things in Firefox is that third-party software can install add-ons and plugins without the user's consent. That's a big no-no from a security standpoint obviously, and it remains a mystery why Mozilla has never bothered to fix that flaw by adding a confirmation dialog whenever a new plugin or add-on tries to install itself automatically. Quicktime Plug-In: The Quicktime Plugin allows you to view a wide variety of multimedia content in Web pages. For more information, visit the QuickTime Web site. The list of plugins varies depending on the software installed on it. Chance is relatively high though that you will find several plugins listed in Firefox that you don't require. Plugins can be disabled in the Plugins manager, but not uninstalled or removed completely from the web browser. Entering about:plugins in the Firefox address bar displays additional information about each installed plugin. Update: Please note that firefox lists the full path automatically now for installed browser plugins. It is no longer required to make the change in the browser's configuration first. Just load about:plugins, and you should see the full path of each plugin there right away. Users who visit the screen for the first time may want to load about:config first in the browser's address bar. Use the search to find the preference plugin.expose_full_path and set it to true with a double-click. This displays the path of plugins in the about:plugins dialog. Displaying the path to the plugin does one thing: it enables you to locate the plugin source on the hard drive. Just open the folder on the hard drive afterwards, backup the plugin file and delete it to remove it completely from Firefox. 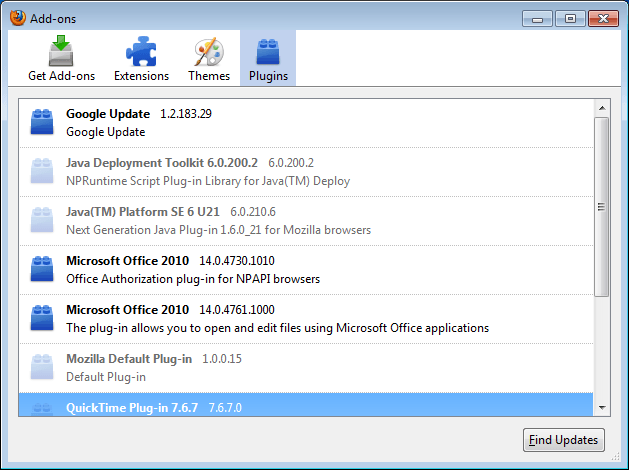 Here is how it is done for the two Microsoft Office 2010 plugins. Locate the plugin paths in about:plugins and open the folders on the hard drive. In the case of Microsoft Office 2010, both plugins are located in the C:\Program Files (x86)\Microsoft Office\Office14\ folder on the hard drive (Please note, that the location on 32-bit systems is C:\Program Files\Microsoft Office\Office14\ instead). The name of the first plugin is NPAUTHZ.DLL, the one of the second NPSPWRAP.DLL. We highly suggest to backup plugins before deleting them from the system just in case they need to be restored at a later time. Plugins can be deleted while the browser is running, and doing so will immediately remove most of them from the about:plugins information window and the plugins manager in Tools > Add-ons. Some plugins may require a browser restart before they are completely removed from the browser. To remove all plugins that are not used or needed simply go through the listing of plugins in about:plugins, locate the paths of those plugins on the hard drive, and backup and delete the plugin files. There is also the possibility that some plugins have added themselves to the Windows Registry, Google Update comes to mind for instance. You can take a look at this guide How To Stop Automatic Plugin Installations In Firefox for an in depth walk-through, or locate HKLM\Software\MozillaPlugins or HKLU\Software\MozillaPlugins in the Windows Registry to see if plugins have been added there as well. Again, export the Registry key first before deleting it, for the ability to restore the setting at a later time. Find out how to remove installed plugins in the Firefox browser completely by identifying their local path, and deleting them. They should provide tool or make these plugins removable from addons manager. Its my browser not some companies that thinks they know what is better for me. I usually get so fed up with these auto plugins that I just bad mouth their products to everyone I meet and recommend competitor products. Skype was the biggest jerk for years until they finally woke up – by Google Voice. Too late Skype, you didn’t listen to user complaints than, users won’t listen to you now. This was very helpful, thanks. I agree that Mozilla should give users functionality to confirm add-on installation, and it also seems like a tool to uninstall them from within the browser would make sense. I used your steps to successfully remove a few plugins. However, the about:plugins page only shows enabled plugins. I have one that Mozilla has disabled, and I’d like to remove it permanently, but I can’t find it. I also can’t find a way to re-enable it temporarily so it would show up in the about:plugins list. Any suggestions? and the plugin won’t be loaded. Any software can write to these directories and direct Firefox to its program. So, search for MozillaPlugins keys in regedit and delete the entries you want to get rid of. Hint: Microsoft updates restore these plugins automatically. They presume it was by accident that you deleted their magnificent, flawless creations. If you updates, recheck firefox for these infections. Guys, the only way to completely make sure of uninstalling certain plugins is to *delete the offending program that installed the plugin from windows itself*. All firefox is doing is listing out contents from a particular file or folder (e.g. the registry). If firefox listed the contents of your C drive, you wouldn’t complain that it’s doing something shady like installing plugins you don’t want. Well that’s all that it’s doing with plugins, it’s just listing files that are there of no fault of its own. Actually, the transparency of this is a lot more preferable to some alternatives. Actually, the only time a program can place a plugin into FF is during installation or updartes that I start of third party software. From there on only a small number of programs are allowed read only access to the registry and Firefox and all other web browsers are forbidden even that as they then become vectors for malware. What it’s doing with plugins is shady as it’s installing software that I may not want or need that I know nothing about. It has no business being in 95% of the registry or performing silent installations and updates which is exactly what it’s doing. And what I see later on when I get messages from my security software that it’s blocked an installaton attempt or there’s something new in the sandbox. There isn’t a lot of transparency in that. The solution is simple, tell me what is being installed or updated, what it does and, if necessary, how to get rid of it when the time comes. Ask mw for my permission, That;’s being transparent. Mozilla has had a strange allergy to that from FF1,. They prefer to hide it behind about:config or about:plugins. =>Save as type: ‘All Files (*. *); replace? Yes. Works for any unwanted FF plugin – just use about:plugins to find .dll file that needs to be made into blank notepad file, save as (name).dll , and make read-only. Also, check Windows Task Scheduler (type “Task Scheduler” w/o quotes in Start menu) & click on “Task Scheduler Library” to disable the updating of many unwanted programs which are automatically added without your permission. Many of these programs auto-update the FF plugins, and also slow down Windows start up (if you use a Mac, I only know how to play Oregon Trail, so sorry on that one). ((8^D – I hope this helped! 2) click on “more” under each plugin you want to remove. 4) Then copy the name by “holding down Control + c” in Windows or “holding down command + c” in mac. 5) Open the finder (in mac) or search (in Win) and paste the address in there. 6) It will find the file. 7) Delete it. In mac ask for your permission (confirmation) by typing your personal login password. 9) You will see that you are able to remove it from the list know. They only differ in the manner in which to obtain the info in (1) above : the original piece’s author gets it from within Firefox’s “about.config” shell, whereas poster “Saman” above gets it from within the Plugins “manager” under Firefox Add-ons. Allow me to correct myself : they are exactly the same in *every* way, BOTH of them obtaining the info from “about:plugins” and then, once located, going to the path in question and deleting the file in question. The difference is that the author of the original piece adds one helpful little extra : if the required info about the plugin doesn’t seem to be available in “about:plugins” he suggests going to “about:config” and setting the “plugin.expose_true_path” preference to TRUE to force “about:config” to reveal the info being sought. Having sort of a problem with this. I’ll just explain my problem in it’s entirety, because maybe this isn’t the solution. I’ve been having major problems with Youtube, the videos last for seconds before needing to buffer for like 25 minutes, then it happens again, lasts for seconds and then buffers. I tried updating Flash, and that worked for about five videos, but then it turned right around and started doing it again. I looked into my add-ons, and both the old version and the new version are active at the same time. I try disabling the old one, but that disables the new one too, and vice-versa. So I though uninstalling the old one would be the solution. I looked under the about:config and for some reason I can’t find plugin.expose_full_path. I don’t know where it is in the config, I even copy and pasted it to the search part and it’s just not there. And without exposing the paths, obviously I can’t delete the file. Can anyone help me? I’m totally confused why this is happening. Two weeks ago the flash worked excellently. No problems at all. I would try and uninstall Flash using the operating system’s uninstall option. If you are using Windows, open the Control Panel and uninstall all versions of Flash from there. Fixed it. Thanks! Dunno why I didn’t think of that earlier. Do we actually NEED to uninstall these plugins? Isn’t it enough just to disable them in firefox? If they stay disabled does that make ff slower or something? Disabling is fine as well. If you are opening a xls file in Firefox I understand the Office plugin skips the prompt where you want to save the file and straight opens it. Why not? These plugins are not that evil. They were made for a sleeker usage in my opinion. Now my notebook is very slow but having all the plugins enabled doesnt slow down my Firefox. At least I dont feel a difference. And I dont see security danger in keeping these plugins. The google update plugin only skips the prompt to download the installation exe and doesnt actually save it. It just runs it. So you dont have to click save, then open downloads window and click on the installation exe to install Chrome. Now that is stupid to install on another browser without our consent. Some of them are good. The only stupid thing is that they dont describe what they actually do in the info so we think they are some mean application designed to push something on us we dont know. The Java DT is stupid. I uninstalled Java DT but the plugin file remained in the Java folder so I had to remove it myself. The problem with plugins is that if they have vulnerabilities, they can be exploited. So, it is better not to run them if they are not needed. I’m trying to play computer games & i keep getting plugins. How do i remove plugins? ideal solution would be the ability to make Firefox block auto installing plugins… but ohh well Mozilla is too busy with other important stuff than adding this basic functionality. I found this article very useful, I have a Mac and was trying to delete a plug in + associated legacy files. I found the file as detailed above, then I put the file name in a little programme called “EasyFind” (free). EasyFind found the files and it has a facility to move the files to “Trash” or “Destroy” – nice. Helga, this is no longer required, as Firefox lists full paths on about:plugins automatically now.